Vauxhall Handsfree Phone Kit Fitted. Do you have all the signs of the Vauxhall bluetooth car kit fitted? Buttons on the steering wheel and a "phone" button on the CD300 or CD400 radio but yet they don't do anything? If so then the Meta Voice Bluetooth Handsfree Phone Kit for Vauxhall is the perfect solution. This Vauxhall handsfree Phone Kit solution is installed behind your dashboard and uses all the vehicles original phone kit buttons to replicate the Vauxhall factory fit option. This ensures there are no additional screens mounted on your vehicles dash board. 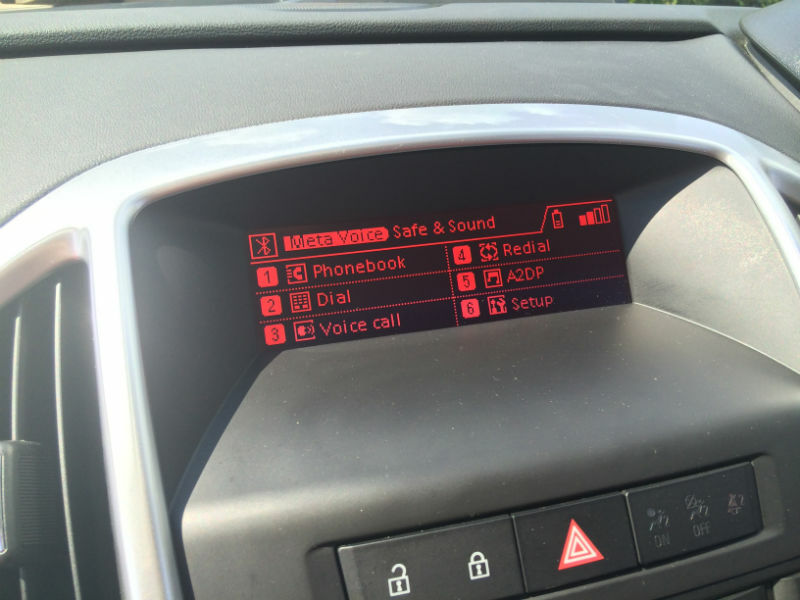 The Vauxhall Handsfree Phone Kit once fitted allows full synchronisation of your devices phone book*, Bluetooth Music Steraming* with full control, last number redial, direct phone book access and direct dial. Safe & Sound offer the mobile installation of this fantastic Vauxhall phone kit throughout Leeds, Bradford, Wakefield, Mirfield, Pudsey, Dewsbury & surrounding areas.